If you’re the observant type, you may have noticed that over the past couple years, fewer and fewer computer manufacturers are calling their portable models “laptops.” In fact, if you look at Apple’s MacBook and MacBook Pro Web pages, you won’t find the word laptop anywhere; instead, you’ll find frequent usage of the term notebook . Why is this? Most in the industry agree that it’s because today’s portable computers run so hot that actually using them on your lap can be not only uncomfortable, but downright dangerous, especially for men. If you’ve used a recent laptop—er, notebook —you surely understand the concern. (Apple goes so far as to warn users of their latest notebooks: Do not leave the bottom of the computer in contact with your lap or any surface of your body for extended periods. Prolonged contact with your body could cause discomfort and potentially a burn. Yikes!) To be fair, such temperatures are largely unavoidable given today’s technology and market: Consumers demand ever-more powerful processors, and such processors produce lots of heat; in a laptop enclosure, the heat doesn’t have anywhere to go. But acknowledging this fact doesn’t make your lap feel any cooler. My solution? A $10 “lap desk” from Target—the kind of wood-top, beanbag-bottom contraption I used as a kid to do homework on my lap. It’s bulky and, well, a little ugly, but it works great for using my MacBook Pro on my lap at home. If you’re mainly concerned with keeping your lap cool at home, and don’t mind cheesy product names, I’ve been impressed by the Lapinator ( ). 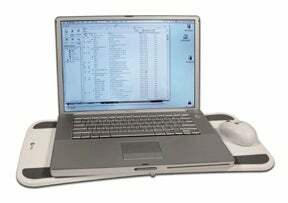 The $25 standard Lapinator is 13 inches wide and 12 inches deep, making it perfect for MacBooks, iBooks, and 12-inch PowerBooks. (15-inch PowerBooks and MacBook Pros fit, but hang over the left and right edges.) The $30 Lapinator Plus is 6 inches wider, making it a better fit for 15-inch and 17-inch laptops, or for using a mouse with a 12-inch or 13-inch laptop. Both models feature a polyethylene top—not completely rigid, but mostly so—that grips rubber laptop feet well. However, for better laptop ventilation, and an even better grip, you also get three 1/2-inch rubber “bumpers” that you can attach to the Lapinator to lift the back of your laptop off the surface. I found these bumpers to be worth using, as they helped keep my MacBook Pro cooler. Just underneath the polyethylene top is a thin layer of 3M’s Type B Thinsulate insulation, the same type used in winter boots, to keep the heat of your computer from reaching your lap. The company claims that the Lapinator blocks 95% of laptop heat; although I didn’t have any hardware instruments on hand to test this claim, I can tell you that my own, em, instruments felt little more than a slight bit of warmth underneath the Lapinator, even when my MacBook Pro was working hard. Finally, the very bottom of the Lapinator provides two horizontal, molded-foam cushions that elevate the main section up and off your legs approximately half an inch for even better ventilation. These cushions also make using the Lapinator a bit more comfortable that the hard-plastic laptop desks I tested (see below). However, I found the cloth covering on the bottom of the Lapinator to be a bit scratchy when used on bare legs. (Then again, the fact that I can actually use my MacBook Pro on my bare legs with the Lapinator is a testament in and of itself.) There’s also a small Velcro loop on the back of the Lapinator designed to wrap up your laptop’s various cables. However, since recent Apple laptops have their ports on the sides, this loop is less useful that it would be with a laptop with rear ports. Although the company claims that the Lapinator is slim enough to slip into your laptop bag, I found that to be a stretch. The standard Lapinator will indeed fit in most laptop bags, but it takes quite a bit of space. And the Lapinator Plus was too wide to fit into any of my bags. On the other hand, if you have a bag big enough to fit, the Lapinator and Lapinator Plus weigh only 11 ounces and 15 ounces, respectively. I also liked Lapinator’s $10 Mousitizer mouse pad. This rigid-plastic platform attaches to the side of either Lapinator and lets you use a small mouse. The Mousitizer even includes an optional foam ridge to keep your mouse from sliding off—I didn’t think I’d need to use this, but after 15 minutes of use, during which I had to pick my mouse up off the floor half a dozen times, I quickly applied it. I really enjoyed the Lapinator/Mousitizer combo at home, but as I mentioned above, I found it to be too bulky for travel. And during travel is when you’re especially likely to use your laptop on your lap. For such situations, you’ll want to check out some of the better “travel” laptop desks I received: MacAlly’s $30 icePad and LapWorks’ $30 Laptop Desk 2.0 and $30 Laptop Desk UltraLite . (The latter is also available as the Targus Notebook Portable LapDesk.) All are very similar in size: The icePad is 20.5 by 10.3 inches and weighs 24 ounces; the Laptop Desk 2.0 is 20.5 inches by 11.2 inches and weighs 22 ounces; and the Laptop Desk Ultralight is 22 by 11 inches and weighs less than 15 ounces. 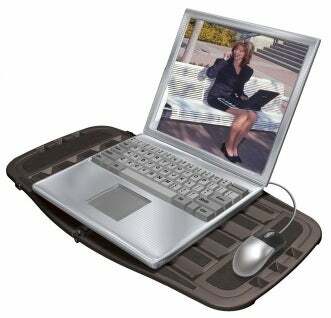 All also use a similar design: A thin, wide, polycarbonate-plastic platform, with elastomer rubber bumpers on top to keep your laptop from sliding, that folds in half for packing. Grooves in the platform let air circulate underneath your laptop to help it cool; the backs of those same grooves allow air to circulate above your legs. Although none of these travel desks block as much heat as the Lapinator—or keep your laptop itself as cool—all make using your laptop on your lap bearable, even comfortable. And they’re all small enough, when folded up, to take with you. Given the similarities between these desks, what are the differences? MacAlly’s icePad ( ) uses a design that’s wider on the ends and narrower in the middle. This gives you a better built-in “mousing” surface on the sides than the other models; however, it also means that deeper laptops hang over the front or back edges of the middle of the desk. And the icePad’s ventilation isn’t quite as good as the LapWorks models. Finally, the bottom of the icePad is bare plastic, which can get uncomfortable after extended use. The Laptop Desk 2.0 ( ) is the most comfortable of the three, thanks to eight long, rubber strips on the bottom, which make the desk both more comfortable and less likely to slide around on your lap. It also feels the sturdiest and blocks the most heat from reaching your legs. 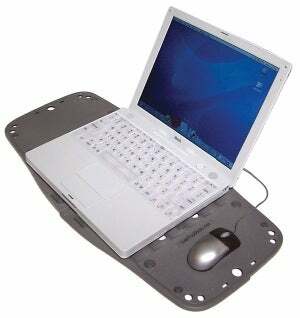 And, as with the Lapinator, an additional $10 will get you a side-mounted mousing surface, the Laptop Desk MouzPad. If you want a single, sturdy laptop desk for use both at home and on the road, the Laptop Desk 2.0 is the way to go. For the dedicated road warrior, however, the LapTop Desk Ultralight ( ) was my favorite of the bunch. While nearly half a pound lighter than, and half as thick as, the other models, making it a better fit for your laptop bag, it's also an inch and a half wider—although a bit cramped, you can use a travel mouse on the Ultralight’s flat side panel (assuming the mouse doesn’t slide off the edge, that is). 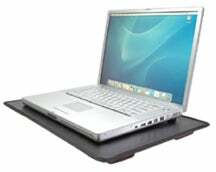 And rubber bumpers on the top of the Ultralight lift up your laptop for even better ventilation than with the other models. There are, however, two drawbacks to the Ultralight. The first is that, because it’s thinner than the other products, it doesn’t protect your legs from quite as much heat; if you’re especially sensitive to heat and have room in your laptop bag, go with the Laptop Desk 2.0. 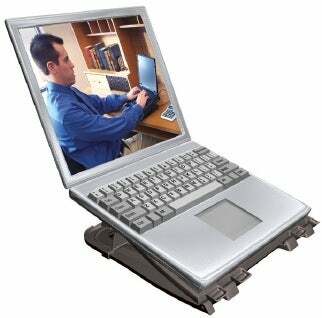 The second is that, because it’s thinner and therefore not as sturdy, the Ultralight’s “desktop stand” mode is rated only for laptops that weigh 5 pounds or less; if you plan to use your laptop desk as a desktop stand, as well, you should opt for the Laptop Desk 2.0 or MacAlly’s icePad. But for the road warrior, size and weight are everything, and in this respect the Ultralight’s a winner—it takes up very little space in your laptop bag and earns its board every time you use it. Of course, I should point out that as good as these solutions are, they still can’t match my $10 beanbag desk in some areas. For example, the beanbag bottom makes it much more comfortable and adjustable, and since it has a large, flat desktop, you can use it to do other things—like filling out crossword or Sudoku puzzles—when you’re not using your laptop. (If you like the idea behind a beanbag desk, but not the generally ugly design of most inexpensive models, for $48 you can get one made of cherry wood from Levenger.) Still, these specialized laptop desks have their advantages, especially when it comes to portability (or even just storability—even the Lapinator is much smaller than my “Target Special”).